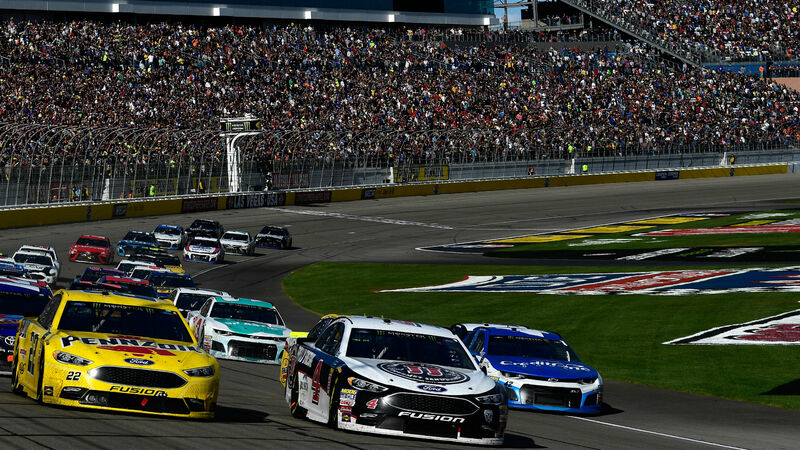 After the regular season ended with a rain-slogged final weekend in Indianapolis, the NASCAR Cup Series playoffs get underway in sunny Las Vegas, with Kyle Busch and Kevin Harvick leading the postseason standings at 2,050 points apiece. But in the first of three races of this playoff round, everything remains open, and even those who barely made the cut — such as perenial Cup contender Jimmie Johnson — could still make a run. Will the hottest drivers of the past couple of months carry momentum into this pivotal race? Brad Keselowski certainly hopes so after winning the final two races of the regular season. For live updates and highlights from Sunday’s Cup race in Las Vegas, follow along here. 4:22 p.m. — Here’s the restart order. Restart order with 67 laps to go in Stage 2: Truex-Bowman-KuBusch-Harvick-Logano-Keselowski-Jones-Elliott-KyBusch-Bowyer-Almirola. Larson will restart 23rd on new tires. 4:18 p.m. — Second caution of the day. 4:16 p.m. — Truex Jr. is in first and Bowman is in second. 4:12 p.m. — Penalty on Ricky Stenhouse. Stenhouse speeding. To the rear. 4:08 p.m. — Denny Hamlin is not enjoying himself. 4:05 p.m. — We’re through Stage 1! It’s been a pretty clean race so far, running caution free. Here’s your top 10. 4:01 p.m. — Tire issue for Larson. 4 p.m. — Ten laps left in Stage 1. Truex Jr., Harvick and Larson make up the top three. Bowman is up to fifth. 3:57 p.m. — More changes near the top! 3:52 p.m. — With 23 laps to go in Stage 1, Alex Bowman continues to impress. After barely making the playoffs, he’s in seventh place. 3:51 p.m. — Martin Truex Jr. is in second. 3:49 p.m. — Thirty laps to go in Stage 1 and Harvick is in control. Harvick back to the lead with 30 laps left in stage 1. 3:45 p.m. — An update following those pit stops. Kevin Harvick will retake the race lead following green-flag pit stops. Meanwhile, Kyle Busch falls from P2 to P4. New running order will be: Harvick-Logano-KuBusch-KyBusch-Truex-Larson-Bowman-Jones-Elliott. 3:42 p.m. — First round of pit stops on lap 36. 3:41 p.m. — Kurt Busch enters the picture on lap 31. 3:35 p.m. — Logano and Kyle Busch are neck-and-neck here at the front. Harvick is up to third. 3:34 p.m. — Potential issue for Chase Elliott. 3:30 p.m. — Here’s your top-5 from the first 15 laps. 15 laps in the books. 3:27 p.m. — Through the first 10 laps Sunday afternoon, Logano, Kyle Busch and Erik Jones lead the way in that order. Jimmie Johnson is back in 18th place. Austin Dillon, who started from the rear, is in 22nd. 3:25 p.m. — Logano and Kyle Busch have the early lead as we enter lap 6. 3:22 p.m. — And we’re off! 3:19 p.m. — This one’s almost underway, folks. Buckle in. 3:04 p.m. — Here are the starting positions. 2:42 p.m. — Perhaps it’s a little too hot here. 2:36 p.m. — There is a crew chief switch for Austin Dillon, who is the playoffs for the third straight year. 2:33 p.m. — Drivers and fans greet each other during pre-race festivities.